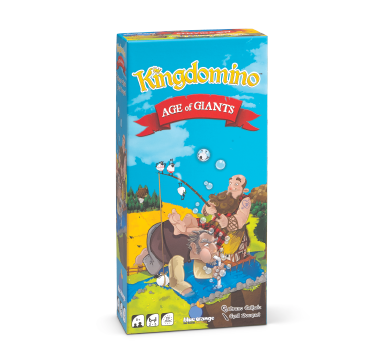 Age of Giants is an expansion for Kingdomino or Queendomino. It adds more challenges, more player interaction, and allows for a fifth player to join in on the game. Choose a tile with a giant, then add a giant meeple to your kingdom- it covers up any crown of your choosing. Choose a tile with a giant�s footsteps, then pass one giant meeple from your kingdom to another player, who then must cover up a crown in their own kingdom. Covered crowns do not score points. End of game bonuses are eliminated, instead, before the start of each game, players must draw 2 challenge tiles. These provide additional ways to get points. For example, get 5 bonus points for each lake tile that surrounds your castle, and get 20 bonus points if your castle is located in one of the 4 corners of your kingdom.